One day, while engaging in his favorite sport, gymnastics, young Willem Einthoven tripped and fell. The result was a broken wrist that kept him from any strenuous activity for several months. The precocious and curious Einthoven made good use of his convalescence to study the pro and supination movements of the hand and the functions of the shoulder and elbow joints, using none other than himself as the patient. Such was the insatiable thirst for knowledge that drove the man who would become famous as the inventor of the electrocardiogram (EKG), one of the most important medical inventions of all time. Willem Einthoven was born on 21 May 1860, in Semarang on the island of Java, in the former Dutch East Indies (now Indonesia). In 1886 he was made a professor of physiology at the University of Leiden, in Holland, where he taught until his death in 1927. At the time, study of the human heart was very undeveloped. 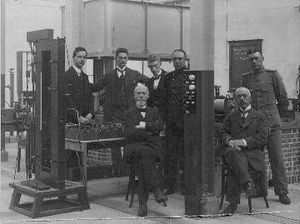 In 1908 he undertook the task of accurately recording the human heart’s sounds using the “Lippmann electrometer.” The inadequacy of the device spurred Einthoven to speculate on ways of improving it. The result of his efforts was the string galvanometer. Truth be told, the principle behind the galvanometer was known and practical applications of it had already been developed in other fields of study. Einthoven’s genius came in refining it for use in measuring the heart’s rhythms, a process that took no less than three years of intense work. The string galvanometer is the most reliable tool used in electrocardiography today. Although it has been somewhat replaced by portable types and by models using amplification techniques like those used in radio communication, cardiograms from the string galvanometer have remained the standard of reference in numerous cases to this day. As a reward for his efforts and contributions to mankind Einthoven was awarded the Nobel Prize in Physiology or Medicine in 1924. His laboratory at the University of Leiden has become a place of pilgrimage, visited by scientists from all over the world. This page was last edited on 8 March 2016, at 18:06.